This is so far one of our favorites. 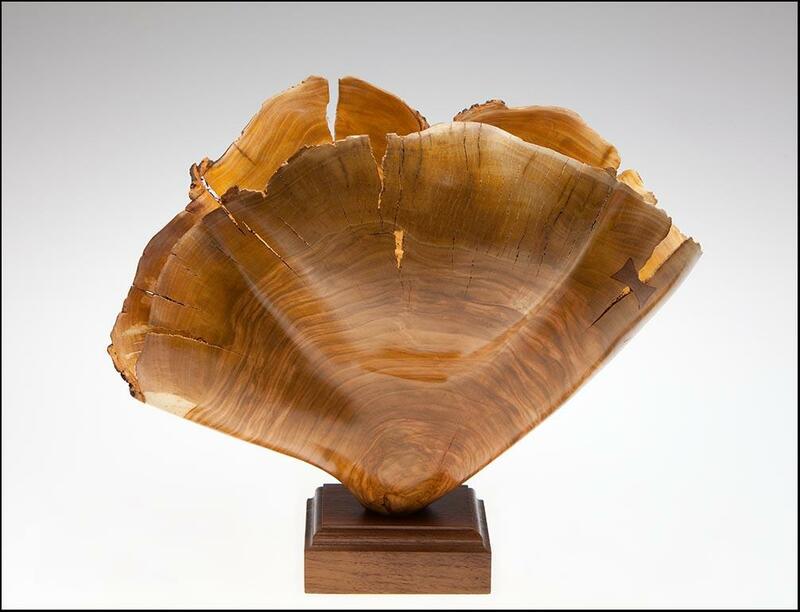 Carved from cherry, with the chainsaw Scott created folds and waves to add depth to the piece. 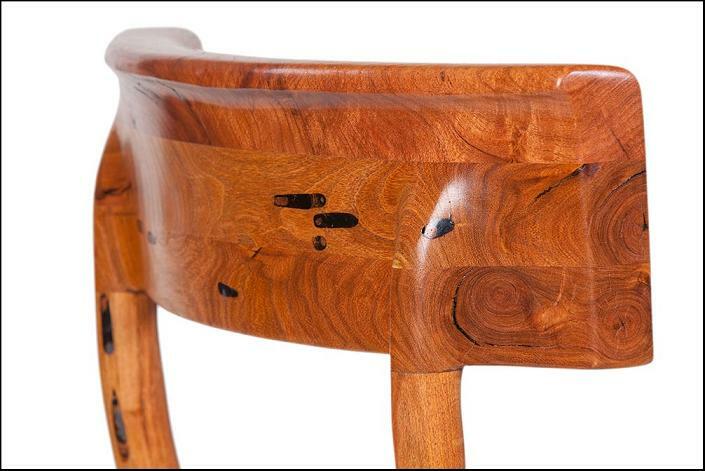 A bowtie was added to a large crack as an accent and a walnut base was created for the vessel to perch on. We decided that this piece was incredible on its own, so no gems or stones were added. The natural cracks were left as they were. 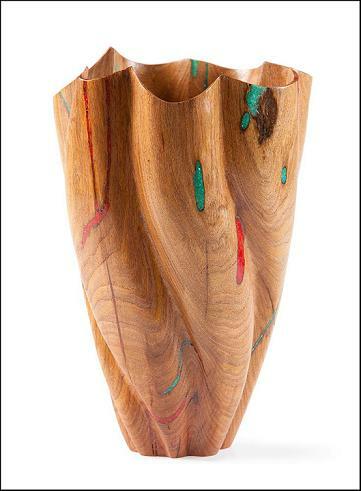 This piece was first placed on the lathe and turned round and brought down to a vase form. Then grinders were used to create the carving on both the outside and inside. 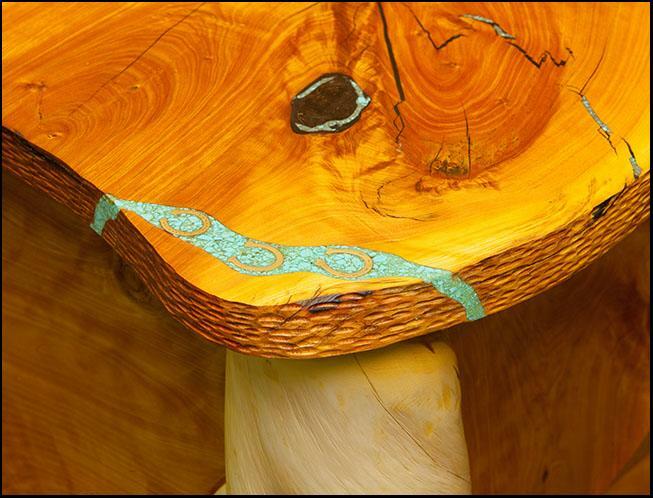 Coral and turquoise were inlayed into the natural cracks and holes. 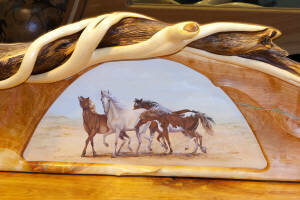 The mesquite has beautiful grain and color patterns and really adds to this piece. 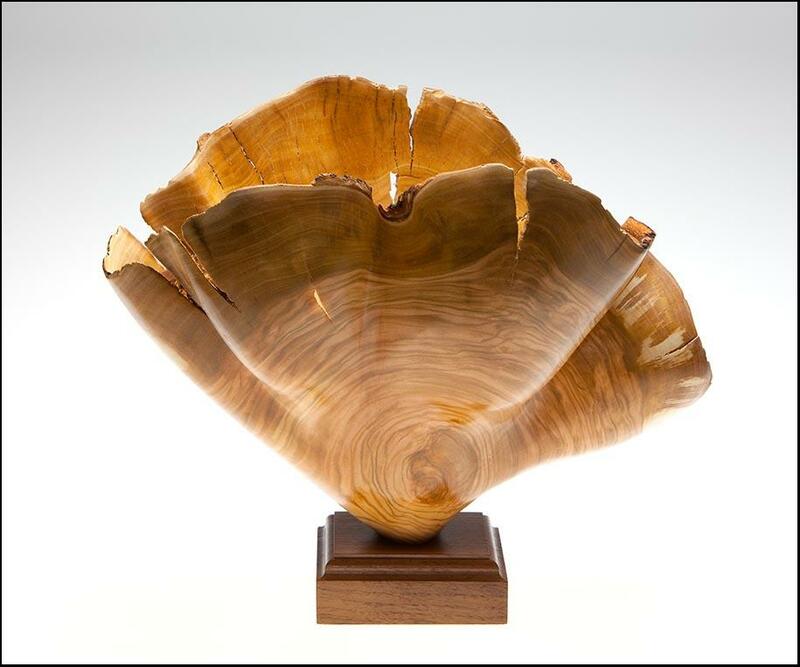 To see more of our vessel creations and to view how these beautiful creations are made, please visit our website. Each vessel is truly a “One of Kind” collector item, since no two are alike. This chair was a prototype for a customer that wanted a chair that resembled the ancient Greek chairs, with some of our own design elements included. Since he was also purchasing several of our Low Back style chairs, we wanted to mesh the two designs together as best we could. 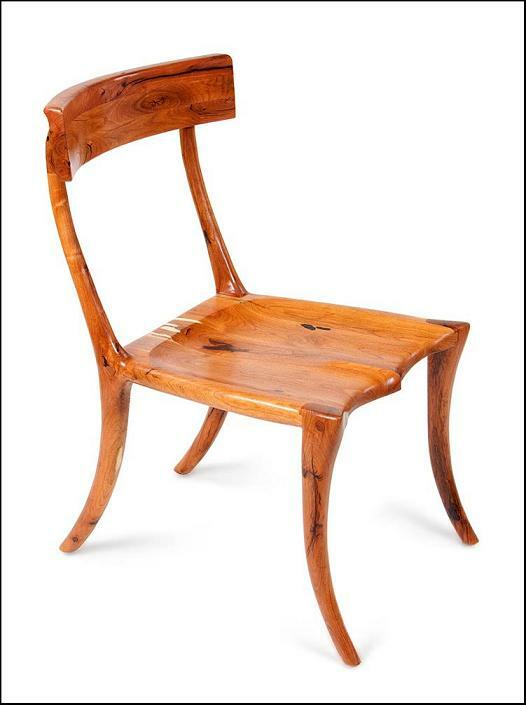 This chair has several unique qualities to it. One of the main features that stands out is the contrasting sweeps on the legs and the graceful bend on the back leg going to the backrest. 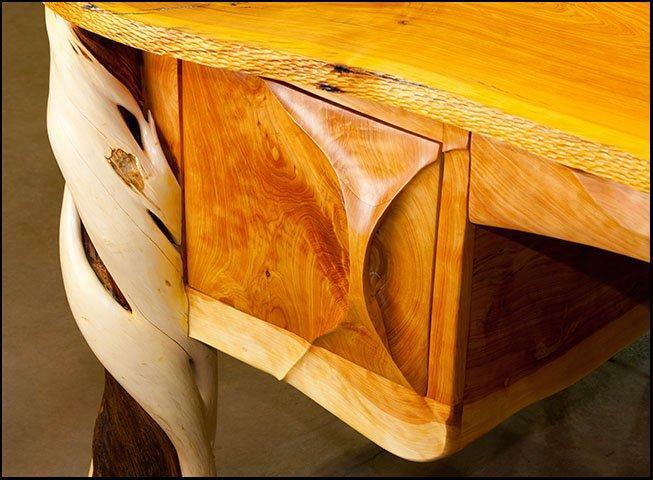 Our favorite feature is the how the back leg is carved into the backrest (see closeup shot above) and how the backrest has a carved lip on it. 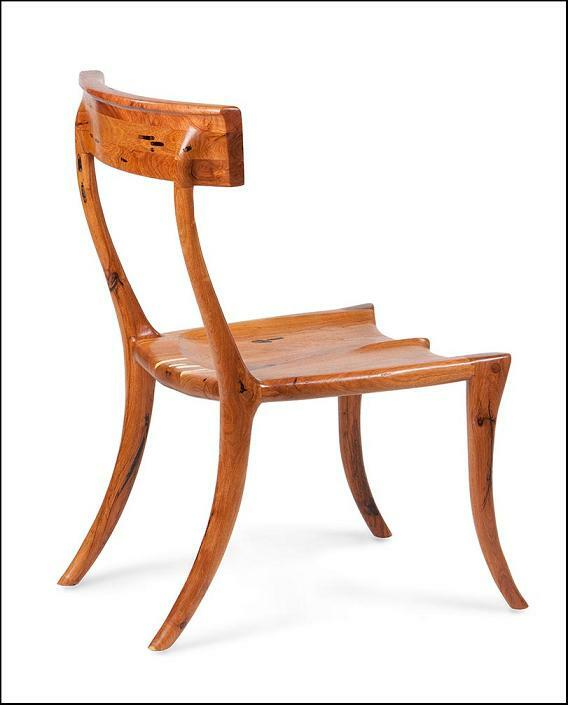 Our signature carved seat makes this chair extremely comfortable as well as beautiful. 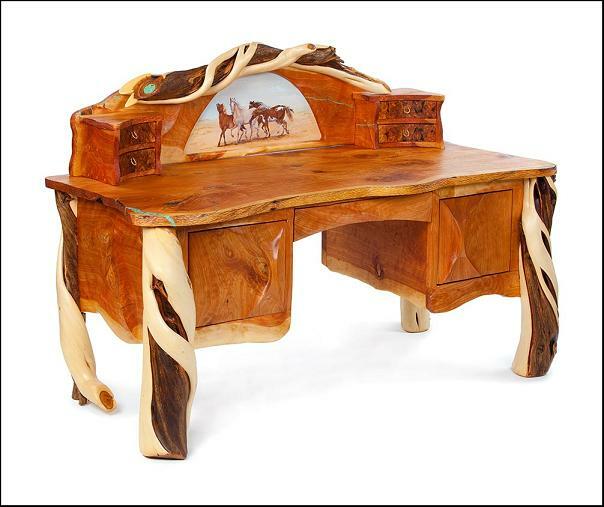 This prototype was made from gorgeous mesquite with all the cracks and worm holes filled with black to make it pop. Thus far this has turned out to be one of our favorite pieces. What makes us most happy about this project, is that our customer was blown away by the design and seemed to enjoy being involved in the design process along with us. 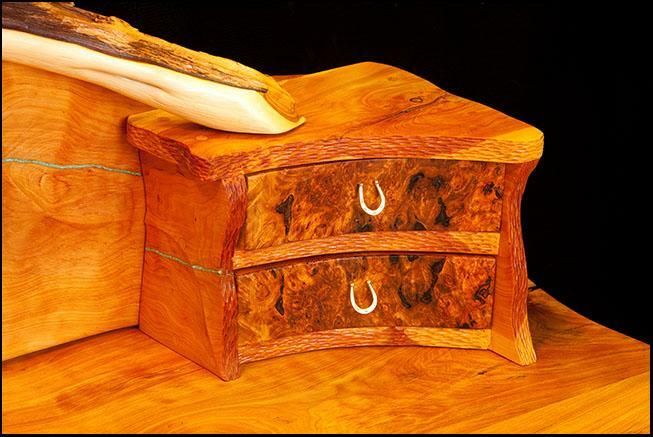 There is no greater compliment than when a customer is that happy with a piece. You are currently browsing the Shangrilawoodworks's Blog blog archives for January, 2010.